Red is one of those movies that was a surprisingly big hit when it came out-- $90 million domestic and another $108 million overseas-- but seems to be totally forgotten already, not even two years after it came out. And it was a fun movie, with a cast including Helen Mirren, John Malkovich at his weirdest, Morgan Freeman, Bruce Willis, and even Ernest Borgnine, may he rest in peace. 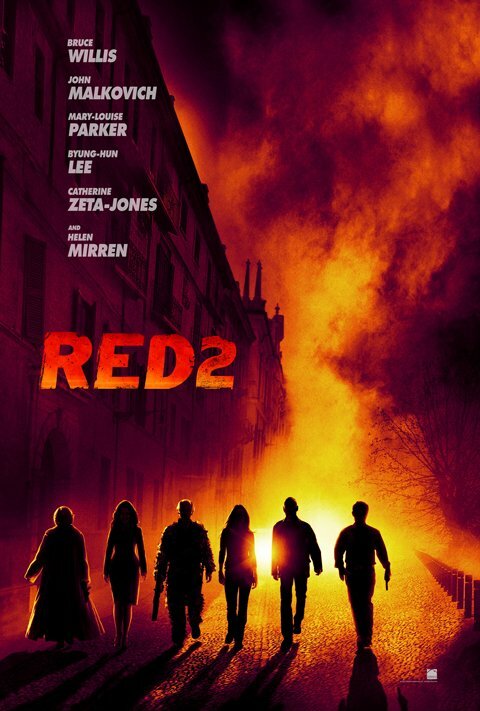 So Summit is hoping to remind you both that this movie ever existed and that you probably liked it with Red 2, currently set to hit theaters about a year from now, on August 2 next summer. Last we heard about the movie they were in the casting process back in May, adding Catherine Zeta-Jones in a role and courting Anthony Hopkins to play a villain. But now Russian site Kino Poisk has picked up on a poster for the film that we've confirmed was used for sales at Cannes earlier this year, that boasts none of the new cast members except G.I. Joe veteran Byung-Hun Lee. It's a pretty neat design, though, so take a look below. If you remember what Malkovich looked like in Red, it's pretty easy to pick him out of this lineup-- use this photo for reference, and just imagine what kind of insanity he's cooked up for the sequel. Of course, this image is likely Photoshopped silhouettes of the cast, who haven't yet united to shoot the film as far as we know. But if Helen Mirren hangs on to that killer duster she's wearing, and especially if some of those potential new cast members pan out, there's a lot to look forward to here. And if you didn't catch Red back when it first opened, give it a look! It's a much more entertaining movie than you'd think given how little we've heard about it since.